It is a symbol of protection. And through its shapes and colors, the mind regains peace and balance. If you look at it, in fact, you concentrate in its center, leaving worries out of the circle, that is, in the external world. Colors with which I made it are light mustard, green agate, blue navy, white, pink. Soft colors, delicate, spiritual, which will help you regain harmony with the world around you. And with yourself. The mandala is for you if you need to relax and be at peace with yourself. Having a mandala next to you will give you Light! 13.5" x 12.6" (34 cm x 32 cm). 100% DROPS cotton, wood treated with light walnut impregnation, final varnish to protect wood. White, green agate, mustard, blue navy, pink. If you do not like these colors, I can make an equal mandala with your favorite colors. For any questions, please, you write me info [! At] dreamingmandalas.com or by private message here on Etsy. Registered Mail shipment, traceable, secure, with estimated delivery times from 7 to 15 days* (Saturdays and holidays excluded). Time needed to prepare an order for shipment: 1 day. The mandala comes with a wooden rod to hang it. WASHING: you can wash it in the washing machine, but with lukewarm water; use only detergents for delicate items, no bleaches or additives, do not wash it with dark colored clothes, centrifuge max 400 rpm. Stretch it out in a horizontal position, in the shade. If you want to iron it, the temperature must be max 302° F (150°C) (2 dots). 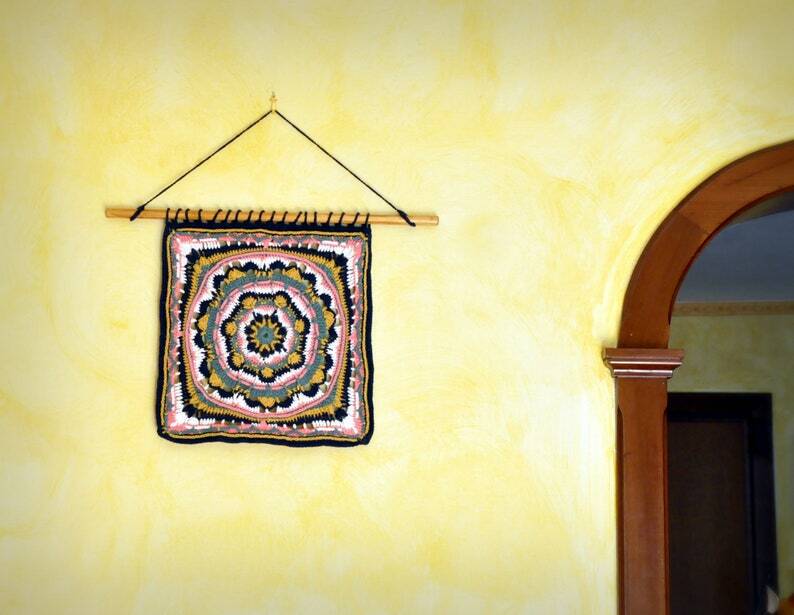 Mandala crochet wall art, holistic décor, italian home decor, meditation and yoga center, mental wellbeing, women's day ideas, for wife. Mandala necklace, wellbeing gifts, waking consciousness, yoga ornament, women accessories, valentines day gypsy, transcendental meditation. Mandala handmade on canvas, flower style, personalized wedding, abstract modern wall art, yoga center decor, anniversary gifts for women. Mandala energy healing necklace, mental health aware, hindu pendant, expectant mothers jewelry protection, gift idea for teacher, buddhist. Mandala zen pendant meditation, buddhist tibetan jewelry, womens necklace, good energy pendants, wedding favor ideas, mental transformation. Mandala handmade, for therapy meditation, inner journey creation, italian home decor, canvas art living room, original wedding gift ideas. Mandala love yourself necklace, lucky charm jewelry, for therapy, meditation practice, benefit of all that lives, mental health awareness. Small mandala round, yellow and green, calm armony balance, yoga center decorations, art with soul, awareness life, mother's day present. Mandala zen painting, personalized name, womens health art, yoga room meditation decor, vibrational energy, vesak day present, tibetan. Healing mandala necklace Sahasrara chakra, buddhist teachings and philosophy, circles symbols of protection, mental health therapist gift. Mandala necklace, for women, young girls, aunt, mom, amulets and talismans, sacred geometry pendant, birthday gift, bride to be sunnies. Necklace with mandala, love sign, pendant heart, with moon and stars, cosmic consciousness, mother's day present, for coworkers, girlfriend.